Born at Poissy, Alphonse was a son of Louis VIII, King of France and Blanche of Castile. He was a younger brother of Louis IX of France and an older brother of Charles I of Sicily. In 1229, his mother, who was regent of France, forced the Treaty of Paris on Raymond VII of Toulouse after his rebellion. It stipulated that a brother of King Louis was to marry Joan of Toulouse, daughter of Raymond VII of Toulouse, and so in 1237 Alphonse married her. Since she was Raymond's only child, they became rulers of Toulouse at Raymond's death in 1249. By the terms of his father's will he received an appanage of Poitou and Auvergne. To enforce this Louis IX won the battle of Taillebourg in the Saintonge War together with Alphonse against a revolt allied with king Henry III of England, who also participated in the battle. Alphonse took part in two crusades with his brother, St Louis, in 1248 (the Seventh Crusade) and in 1270 (the Eighth Crusade). For the first of these, he raised a large sum and a substantial force, arriving in Damietta on 24 October 1249, after the town had already been captured. He sailed for home on 10 August 1250. His father-in-law had died while he was away, and he went directly to Toulouse to take possession. There was some resistance to his accession as count, which was suppressed with the help of his mother Blanche of Castile who was acting as regent in the absence of Louis IX. The county of Toulouse, since then, was joined to Alphonse's appanage. In 1252, on the death of his mother, Blanche of Castile, Alphonse was joint regent with Charles of Anjou until the return of Louis IX. During that time he took a great part in the campaigns and negotiations which led to the Treaty of Paris in 1259, under which King Henry III of England recognized his loss of continental territory to France (including Normandy, Maine, Anjou, and Poitou) in exchange for France withdrawing support from English rebels. 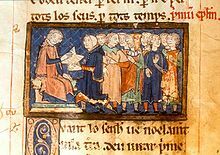 Aside from the crusades, Alphonse stayed primarily in Paris, governing his estates by officials, inspectors who reviewed the officials' work, and a constant stream of messages. His main work was on his own estates. There he repaired the evils of the Albigensian war and made a first attempt at administrative centralization, thus preparing the way for union with the crown. He is remembered for founding the bastide town of Villeneuve-sur-Lot which straddles the River Lot and still contains many of its original structures, including one of the first bridges across the river. The charter known as "Alphonsine," granted to the town of Riom, became the code of public law for Auvergne. Honest and moderate, protecting the middle classes against exactions of the nobles, he exercised a happy influence upon the south, in spite of his naturally despotic character and his continual and pressing need of money. He is noted for ordering the first recorded local expulsion of Jews, when he did so in Poitou in 1249. When Louis IX again engaged in a crusade (the Eighth Crusade), Alphonse again raised a large sum of money and accompanied his brother. This time, however, he did not return to France, dying while on his way back, probably at Savona in Italy, on 21 August 1271. Alphonse's death without heirs raised some questions as to the succession to his lands. One possibility was that they should revert to the crown, another that they should be redistributed to his family. The latter was claimed by Charles of Anjou, but in 1283 Parlement decided that the County of Toulouse should revert to the crown, if there were no male heirs. Alphonse's wife Joan (who died four days after Alphonse) had attempted to dispose of some of her inherited lands in her will. Joan was the only surviving child and heiress of Raymond VII, Count of Toulouse, Duke of Narbonne, and Marquis of Provence, so under Provençal and French law, the lands should have gone to her nearest male relative. But, her will was invalidated by Parlement in 1274. One specific bequest in Alphonse's will, giving his wife's lands in the Comtat Venaissin to the Holy See, was allowed, and it became a Papal territory, a status that it retained until 1791. Wikimedia Commons has media related to Alphonse de Poitiers. ^ a b c Hallam. p. 258. Hallam, Elizabeth M. (1980). Capetian France, 987-1328. ISBN 0-582-48909-1. Jackson, Guida M. (1999). Women rulers throughout the ages: an illustrated guide. ABC-CLIO, Inc.
Strayer, Joseph R. (1969). "The Crusades of Louis IX". In R. L. Wolff; H. W. Hazard (eds.). The later Crusades, 1189-1311 (A History of the Crusades, volume, II). pp. 486–518. This article incorporates text from a publication now in the public domain: Chisholm, Hugh, ed. (1911). "Alphonse" . Encyclopædia Britannica. 1 (11th ed.). Cambridge University Press. p. 733. This cites Ledain, Bourarie, and Molinier as listed below. A. Molinier, Correspondance administrative d'Alphonse de Poitiers in the Collection de documents inédits pour servir à l'histoire de France (Paris, 1894 and 1895). This page was last edited on 19 August 2018, at 06:59 (UTC).